PhD students Todd Alexander and Lindsay Lozeau have developed an antimicrobial coating that could present a safer, more cost-effective way for medical facilities to prevent infections. As if winning the Foisie Business School Hitchcock Innovation Prize this past spring wasn’t enough, the innovation recently shared first prize in the student category of the TechSandBox Pitch Fest competition, and $750 to help bring the product to market. Sharing the prize was another start-up team, DropZoneforVeterans, from Babson College. Hopkinton start-up incubator TechSandBox offers space and a wide network of support and resources for innovators, and 2016 marked the fourth year for its Pitch Fest competition, where a panel of judges decides which project pitch holds the most promise, offering cash prizes. Together, Alexander (who is working on a graduate degree in innovation and entrepreneurship in biomedical engineering) and Lozeau (in chemical engineering) have found a way to prevent infections that can be caused by medical devices. Their research targets urinary catheters, specifically. It’s this specificity—focusing on just urinary catheters and not all medical devices—that helped distinguish their product, AMProtection, says Barbara Finer, CEO of TechSandBox. “We don’t get that many revolutionary, hard-science start-ups that are trying commercialize something” in Pitch Fest, she says. “It can be hard to commercialize, hard science … it takes a lot of brain cells and expense.” Focusing on a niche market, in this case, urinary catheters, is smart, and an approach many entrepreneurs don’t take, according to Finer. “Many want to boil the ocean,” and keep things too general, she says. In this case, their more targeted focus likely contributed to Alexander and Lozeau winning the day. Alexander says that there are several main points that make the AMProtection antimicrobial coating a valuable product in the healthcare industry. In general, use of medical devices makes patients more susceptible to infection because bacteria can become attached to them. And even with treatment, antibiotic resistance can lead to infections not being healed as quickly as they should, he says. This concept of keeping infections from occurring in the first place will save patients undue discomfort and hospitals from spending additional money to detect these infections — which can be difficult to do in urinary catheters, says Alexander. Cases of urinary catheter infections also affect hospital statistics, he says, and potentially lead to Medicare or Medicaid funding cuts. “It would be really hard for any hospital in the bottom 25 percent to recover from that,” adds Lozeau. 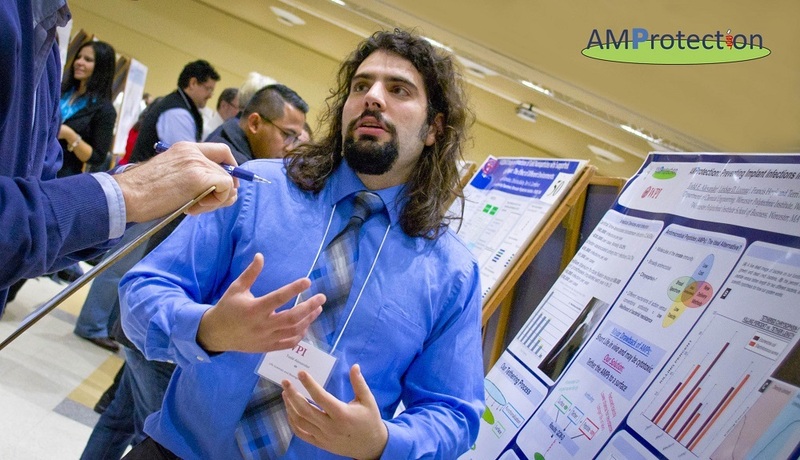 Both Alexander and Lozeau are IGERT (Integrative Graduate Education and Research Traineeship) Fellows, and came to the original concept behind AMProtection about two years ago, after winning a National Science Foundation I-Corps grant. Since then, and with the help of dean of graduate studies and professor of chemical engineering Terri Camesano and Todd Keiller, director of Intellectual Property and Innovation at WPI, the project has evolved into a limited liability corporation, or LLC. AMProtection will now apply for a Small Business Innovation Research (SBIR) grant, hopefully to get $150,000 from the government for more research and product improvement, says Alexander. A high-fidelity prototype will be built, and benchtop tests conducted. With a successful Phase 1, Phase 2 brings a higher chance of grants and funding, says Lozeau, and involves collecting letters of support from potential licensees and reaching out to angel investors. As for Finer, the latest TechSandBox Pitch Fest had more science-related entries like AMProtection than ever before, a trend she’d love to see continue.